We spent a week in May staying at Hotel El Paso, one of the PortAdventura resort hotels. There were pluses to staying at that particular resort, we were literally a stones throw from the theme park, a short walk and you were there. As the opening hours for the theme park were really good 10am – 8pm, we spend the morning at the hotel swimming pool then pop over to the park in the afternoon. It was so convenient being close, it gave us the best of both worlds, a chance to relax when we needed it with the excitement of a fab theme park when we wanted it. I didn’t like everything about our stay, for one I don’t get the need to have corridor music, seriously I love Spanish music but from just before 9am until 9pm at night it gets a bit repetitive especially if you have popped back to your room for some R&R midway through the day. Then breakfast, in itself the food was great (I can live on nutella covered pancakes! ), a big dining room, enough choice and service with a smile. But you had to pick a timeslot each day, not knowing on arrival how busy the park would be etc we went with 8am – 8:30am that was a hard time to meet as the week progressed and we were tired out from long days at the theme park! I think we should have given ourselves a couple of 9:30am slots later in the week to get some rest. We had to keep waking the boys for breakfast, which seemed a shame. But everyone was a fan of the desserts at lunch and dinner. 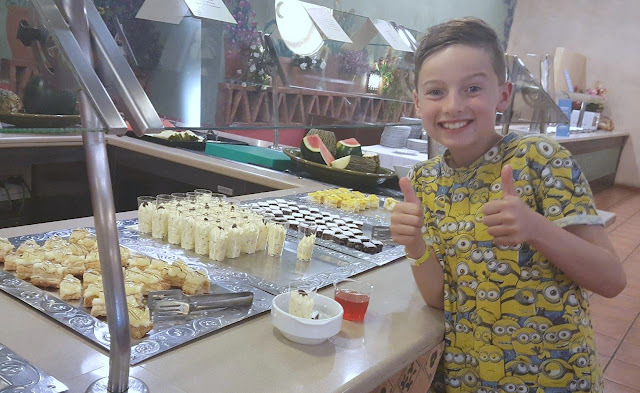 With our board option you could chose to have lunch in the theme park at no extra cost, this was handy to save you coming back out and gave us a bit more variety. Generally we had a good experience eating in the theme park except one time when they managed to royally mess up our order, it was the restaurant at SesamoAdventura. My advice would be to eat earlier than anywhere near to closing time as they are not interested in anything but packing up, cleaning etc rather than providing a nice dining experience. The pool was lovely, really well kept and clean with fun cannons for children to play with in a separate section. They also had additional entertainment there like a game of ball in the pool which eldest loved. Fair play to the two girl entertainers they work very hard and always seemed happy. The life guards were a bit hit and miss, if you tried to get into the pool wearing a pair of glasses they would spot you a mile off and quickly dash into action BUT if you were struggling in the water that could end up being missed. I actually pulled a girl from the water myself, her parents were far away (out of view) and she was calling for help and trying to stay afloat, getting more and more distressed, the lifeguards didn’t spot that! Seriously I think they need to be less keen on the glasses rule and more focused on the kids in the pool. Although I do think parents should sit by the pool their kids are in at the very least too, especially if your child isn’t a strong swimmer. In terms of the glasses rule you can buy a band from the hotel shop for just shy of 4 euros and that will keep you in the lifeguard’s good books! The room itself was pleasant, the balcony is a bit of a non-event, too tiny to really enjoy sitting out on. But we did have a great view of giant rollercoaster in Ferrari Land and was fun watching that go round. 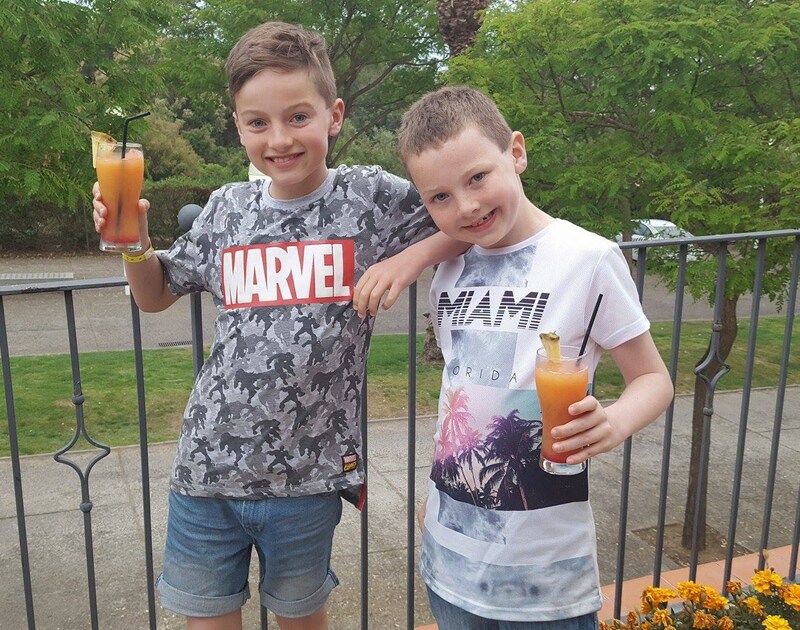 I loved the cocktails and they even did kid friendly ones, although the boys did prefer pop to those. Noise is an issue, people at the hotel don’t have any consideration coming back to their room in the night, it was so loud and the room didn’t seem to have any kind of sound insulation. SO prepare yourself for a week of being pretty exhausted. It was okay until the last couple of days then I was desperate for more sleep. If you’re a heavy sleeper though you probably will be okay. 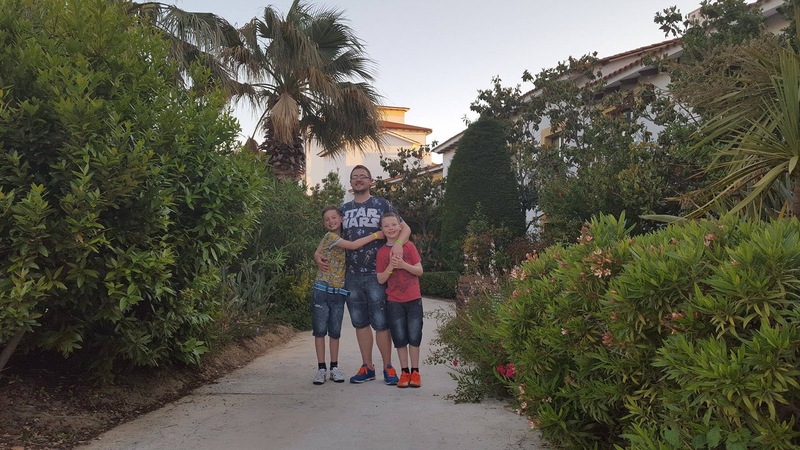 It was an affordable stay being all-inclusive and having unlimited entry to the PortAventura theme park we spent very little once we arrived on holiday. You could walk into Salou and it was nice to sit on the beach two mornings. We also had a trip to Barcelona so the boys could see the football ground, but will cover that in a later blog post. I would probably book again, the theme park was so much fun, but take earplugs!